Since the increased use of manure storage facilities in agriculture there have been numerous instances where a farmer, family member, or employee has asphyxiated or succumbed to toxic gases from the storage. Cases have been documented where several individuals have died while attempting to rescue a coworker or family member from an underground pit or a spreader tank. What toxic gases are present around such storage facilities? The four main gases produced from decomposing manure are Hydrogen Sulfide, Methane, Ammonia, and Carbon Dioxide. In high concentrations, each of these gases may pose a health threat to humans and livestock. In animal housing facilities, where the manure pit is often located below the facility floor, manure gases are generally detectable in low concentrations throughout the year. When pits are agitated for pumping, some or all of these gases are rapidly released from the manure and may reach toxic levels or displace oxygen, increasing the risk to humans and livestock. Toxic or poisonous reactions in people or animals, oxygen depletion which can result in asphyxiation and explosions that can occur when oxygen mixes with the gases such as methane. Hydrogen sulfide is considered the most dangerous of the byproducts of manure decomposition. It has a, distinct rotten egg smell and is heavier than air. After breathing this gas for a short time, your sense of smell becomes fatigued and you can no longer detect an odor. At low concentrations H2S irritates the eyes and respiratory tract while at moderate levels exposure causes headache, nausea, and dizziness. At high concentrations H2S paralyzes the nerve cells of the nose to the point where the person can no longer smell the gas. Both carbon dioxide and hydrogen sulfide are heavier than air, and will tend to settle to the lower areas of the storage facility and remain in high concentrations even after ventilation. Carbon Dioxide is heavier than air and difficult to detect. It replaces Oxygen in air and acts as an asphyxiate. At moderate concentrations it causes shortness of breath and dizziness. It is a major contributing factor to animal deaths by asphyxiation in confinement buildings with faulty ventilation. In addition to manure decomposition, carbon dioxide is also a byproduct of livestock respiration. Methane is odorless and lighter than air, so it tends to accumulate at the top of manure pits. It is considered an asphyxiate at extremely high concentrations. The main hazard is its flammable, explosive nature. Methane is extremely difficult to detect without gas detection instruments because it is odorless, but it should be anticipated as being present in all manure storage areas. Some systems for storing the manure are more dangerous than others. Below ground storage facilities, or pits, are more hazardous than above ground structures. Systems that are covered by lids, caps or slotted floors are more hazardous than uncovered systems. Pump-out pits or caps can also be very hazardous. Leaks from storage structures may also cause significant losses of fish and other aquatic species if near streams or lakes. Construct manure storage pits outside confinement buildings, above or below ground, and in a way that gases cannot move back into the building. Make sure that pumping equipment can be quickly and easily removed for repairs or adjustment. Covered or enclosed tank facilities present the greatest danger, especially when manure is being agitated or pumped out of the structure. Little gas is produced or accumulates when the manure is still and natural air movement or ventilation from fans prevents gas buildup. 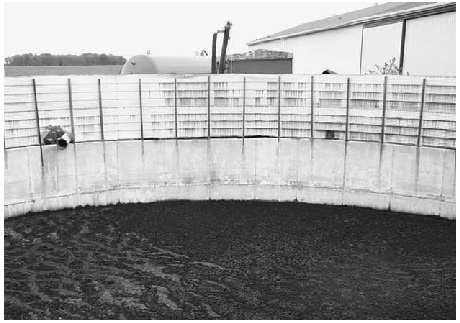 The primary advantages of liquid manure storage facilities are that they make the waste handling process less demanding on your time and allow for applications of manure on croplands at more convenient or appropriate times. In general, there are three types of liquid manure storage systems being used. a) Large manure storage tanks located directly underneath the livestock housing area. b) Manure storage located away from the livestock housing areas in open lagoons or ponds. c) Above ground, silo-type, manure storage structures. In all three types, the manure is flushed from the livestock housing area with added water and then agitated by various means to form liquid slurry. 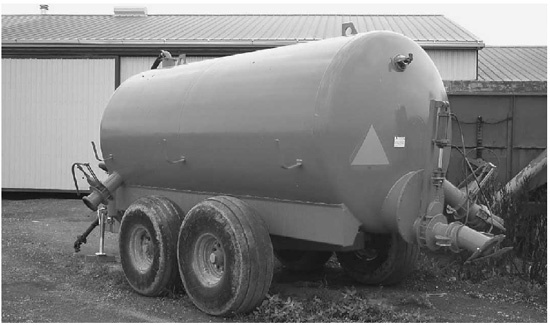 This slurry is then pumped periodically from the storage area into applicator tank wagons or through irrigation systems for application on crop land as a valuable fertilizer and soil conditioner. When animal waste of any type is being stored in large quantities, a number of hazards are present for both man and animal. The most obvious hazard is the potential danger of falling into one of the large open storage areas and drowning. There is also the danger from manure gases, which are produced as the manure is decomposed by bacterial action. During the decomposition process, a variety of gases are released which can be hazardous to both people and livestock. Knowing the nature of these gases and the effects they might have on you should reduce the potential risk of working around manure storage areas. In addition to adhering to proper construction and maintenance procedures for liquid manure storage facilities, owners should be encouraged to follow a few precautionary measures to protect both workers and livestock from harmful manure gases. Know the physical effects of the various gases released during manure decomposition. If at any time these effects are detected, it is critically important that both workers and livestock are evacuated from the area or ample ventilation provided. Maintain adequate ventilation in all confined areas where livestock are housed or livestock waste is stored. This is especially true if the manure is being agitated, since agitation causes a rapid release of gases. Even with the facility's ventilation system operating, high levels of toxic gases can accumulate quickly. Ventilation recommendations are available from a number of sources. If the power fails, open all windows and doors and remove livestock if possible. Many farmers with livestock confinement operations have invested in portable or emergency power generating units to insure livestock housing areas have continuous power for ventilation. Since a methane/air mixture can be highly explosive, prohibit smoking or other open flames in confined housing or manure storage areas. Manure ponds or lagoons should, if at all possible, be fenced in to prevent access by children or livestock. Open lagoons can appear deceptively solid during warm weather and lure the curious out onto the surface. Remind children, visitors and any nonessential workers to stay away from manure pits and transfer/holding tanks, especially during agitation and pumping. Do not allow people to enter livestock buildings during agitation and pumping of manure pits under the building floor. Full respiratory protection, in the form of self-contained breathing units, should be utilized at all times. No one should ever enter a manure storage pit - even to rescue a victim overcome by gases -without a supply of air and assistance from a backup crew using a lifeline. Avoid entering manure storage areas if at all possible. Many deaths have occurred when people entered manure storage areas without proper safety precautions. If you must enter a manure storage area, the following confined space entry procedures will minimize, but not eliminate, the risks. Never enter a manure pit during or just after agitation because there is always the possibility of deadly concentration of this gas. Plumbing and pumping equipment should be installed so that it can be easily removed for repairs. Before agitation, take steps to ensure the welfare of the animals and people working in the area. Remove all people and animals if possible. If animals cannot be removed, maximize ventilation and agitate slurry very slowly at first. Monitor the condition of the animals. If the animals act restless or agitated or abnormal, stop the agitation immediately and ventilate the area. Always keep at least one foot of space between the highest manure level and the slats. This protects animals who lie on the slats and inhale the gases that accumulate at the surface of the pit. OR Test before entering. Test the oxygen level to make sure that adequate oxygen is available. Also test for hydrogen sulfide, a particularly toxic gas, to be sure that concentrations are safe (less than 10 ppm). Monitor conditions. Agitation from working can increase the toxic gas levels. Monitor conditions while working. When someone collapses in a pit, gases are so concentrated that it is suicidal for anyone else to enter without a self-contained breathing apparatus. The only reasonable immediate action is to ventilate the storage area and notify rescue personnel who can bring the proper equipment. Use a safety line. A worker in a confined space or manure storage area should wear a body harness with a safety line. The safety line should be held by enough people and/or a winch so that the worker can be pulled out of the area if a problem develops. Wear a supplied air respirator. Never a pit without one. The person using a respirator should be trained on the use of the mask. It is particularly important that the mask form a tight seal around the face. Due to the equipment requirements and inherent risks associated with entering an area where there may be toxic gases or insufficient oxygen, you should consider hiring a professional trained in working in these areas to perform maintenance tasks. If hiring a professional or using a SCBA is not possible, the best advice is to stay out of the pit.